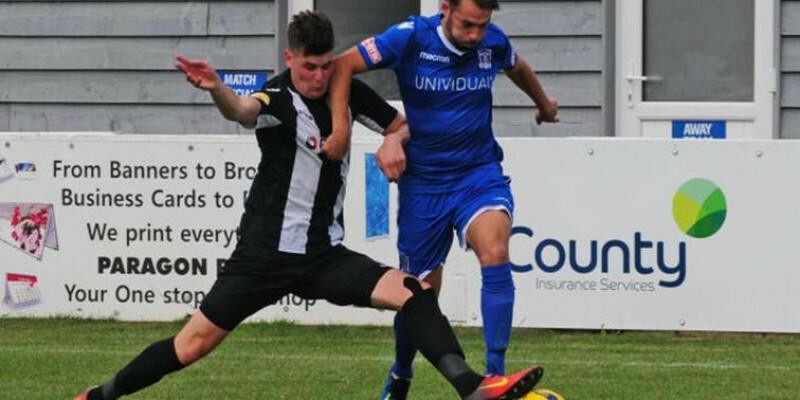 Supermarine coasted into the second qualifying round after a superb second half performance saw them brush past Suffolk side Woodbridge Town in a team record FA Cup victory. ’Marine scored with their first real attack of the game as Stuart Fleetwood cleverly turned in the box, steering his effort past Alfie Strange after receiving a first time pass from Josh Parsons. Six minutes later the game took a surprising turn as the Woodpeckers got themselves an equaliser when Liam Scopes headed home unmarked from a corner from the left hand side. ’Captain Zak Westlake saw his header cleared off the line before two goal midweek hero, Parsons coolly slotted home from a Fleetwood through ball to restore order. Both sides would go close before halftime as Kelsey Trotter forced Josh Hill into a low save before Luke Williams almost scored his first goal in ’Marine colours but his effort went just wide of the post into the side-netting. Each team then picked up a booking on the stroke of half-time with Aaron Churchyard and Fleetwood both going in the referee’s book for fouls. Parsons made it three shortly after half-time when he finished low after more excellent teamwork from Fleetwood and Ryan Campbell. It would quickly become four and then five as Campbell and Parsons scored twice in quick succession. Campbell’s goal came after he played a ball into Fleetwood on the edge of the box, who controlled and backheeled a ball back to Campbell who had continued his run into the box and he smashed a wonderful low effort into the far corner of the net. Conor McDonagh crossed for Parsons to tap home for five, completing his hat-trick. That goal was Josh’s 120th goal in 169 appearances, now only 16 goals short of all-time leading scorer Damon York. Substitute Connor Thompson curled wide before Westlake headed over from a Thompson cross before McDonagh forced another good save out of Stronge with a fine header, all in the space of three minutes as the home side showed no signs of taking their foot off the gas. Trotter went close again for the visitors with a quarter of an hour to play when he headed wide, then two minutes later, Westlake finally added the 6th, heading home a Michael Hopkins free-kick which was his 6th goal in 81 games for ’Marine. A couple of minutes later it was 7 (seven) as Williams tiptoed his way along the left touchline following a pass from Hopkins and fired an effort towards goal that hit a defender at the near post before nestling in the back of the net. ’Marine continued to push forward in an effort to score more, as Fleetwood hit the post with a volley on the turn, ahead of McDonagh seeing an effort blocked before curling another effort just wide.